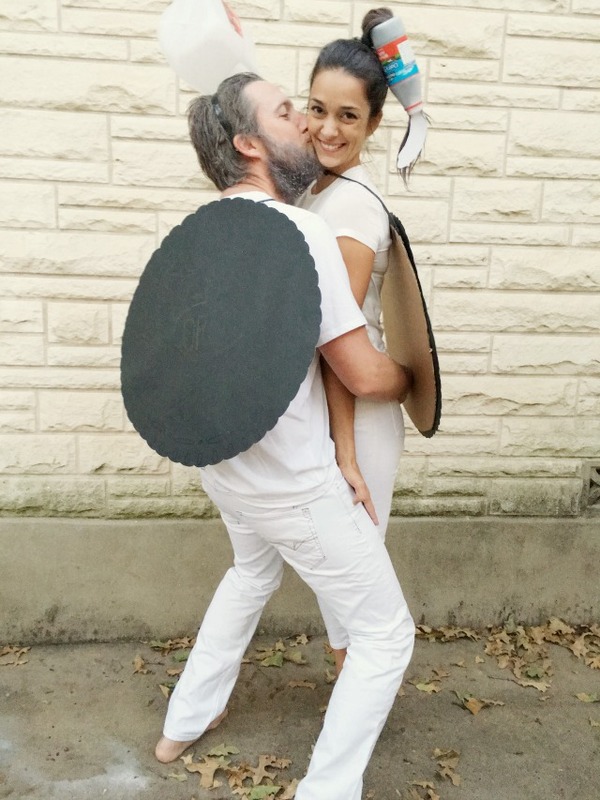 DIY Couples Costumes - C.R.A.F.T. 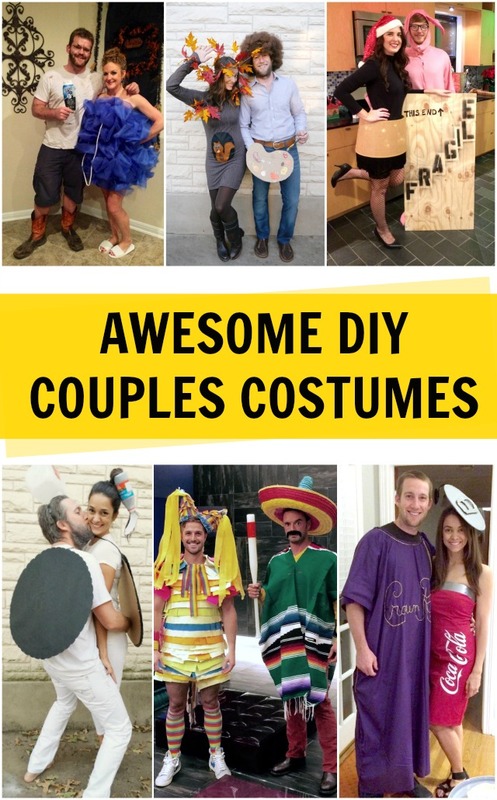 If you’re on the hunt for the perfect Halloween costume for you and yours, this list of 22 DIY couples costumes has you covered! 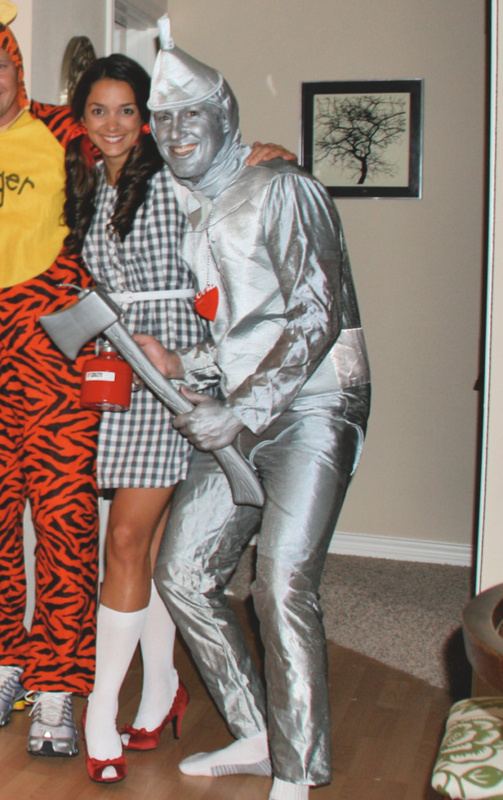 This list of DIY Halloween costumes for couples comes from cartoons, tv shows, and movies. There is even one famous book couple that made the list. 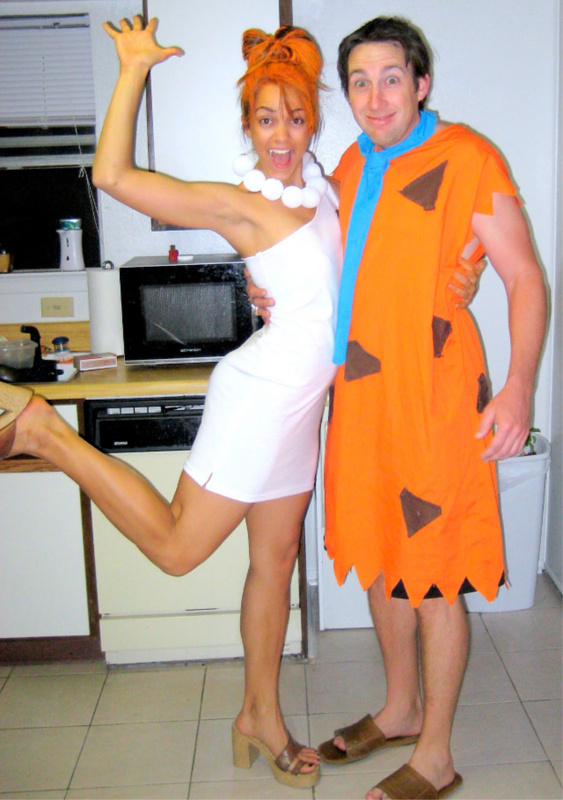 While wearing Fred and Wilma Flintstone costumes you are guaranteed to have a “yabba-dabba-doo time, a dabba-doo time, a gay old time” this Halloween! For more details about how to make this costume, check out C.R.A.F.T. 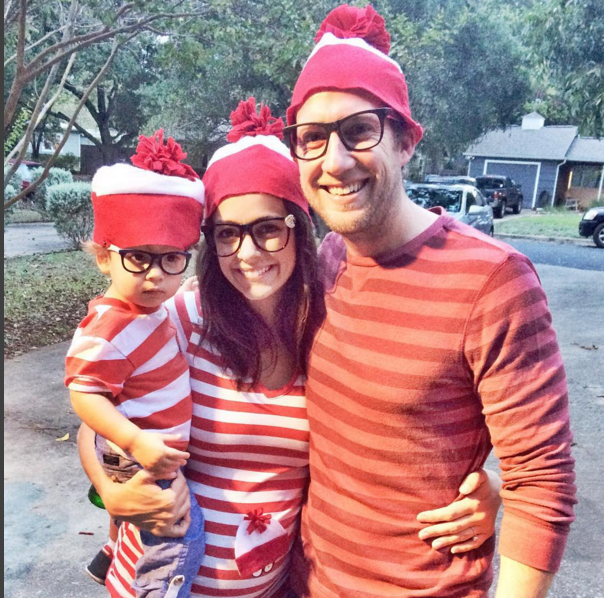 Waldo and Wenda costumes are cute for a couple, a family, or a large group! (How cute is this office of Waldo’s?!) If you happen to be pregnant, consider sneaking in a 4th Waldo on the belly, like below! For a complete tutorial hop on over to the Where’s Waldo costume DIY on C.R.A.F.T. If you’re short on time or lack sewing skills, you can buy the shirt, hat, and glasses on Amazon. 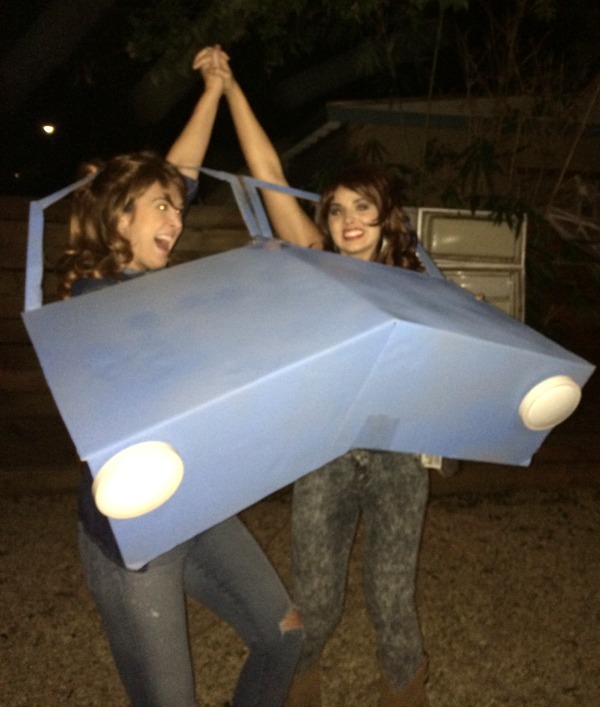 The classic movie from 1991, Thelma and Louise, is the perfect Halloween costume for you and the bestie! Best part? You likely have most of the costume peices in your closet! Make sure and save time to craft up a giant cardboard blue car! Bob Ross is back! His iconic show “The Joy of Painting” is on Netflix and allowing kids of the 90’s to relive their painting dreams. (Oh wait, is that just me?) 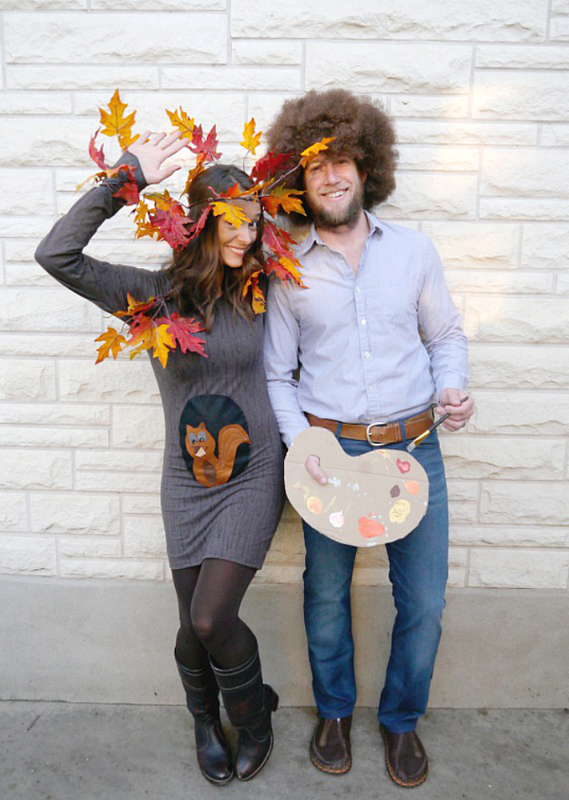 Either way, this DIY Bob Ross and Happy Tree costume is sure to win you first place in the Halloween costume. Also fun to note, I am pregnant in this costume, and the squirrel in my tree represents baby boy! If you love classic horror movies, this is the costume for you! 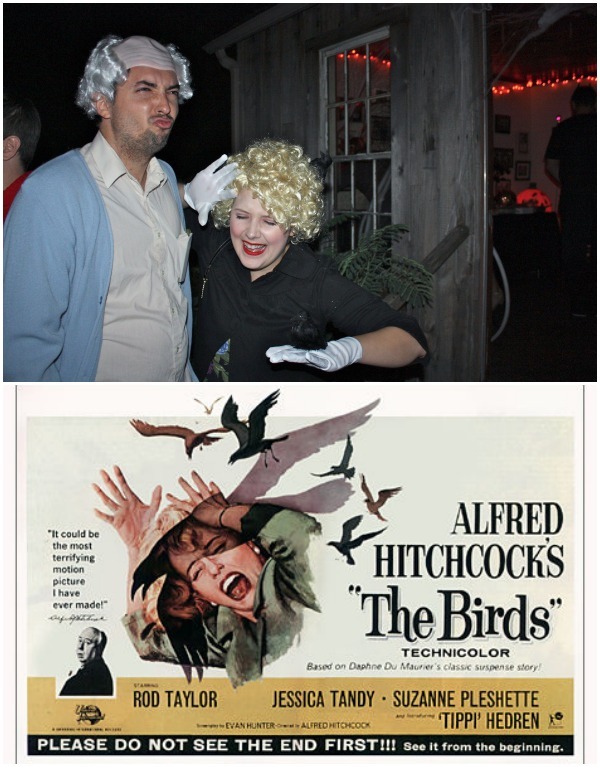 Costume essentials for Tippi include a curly blonde wig and must be good at striking the perfect “bird attack” pose. 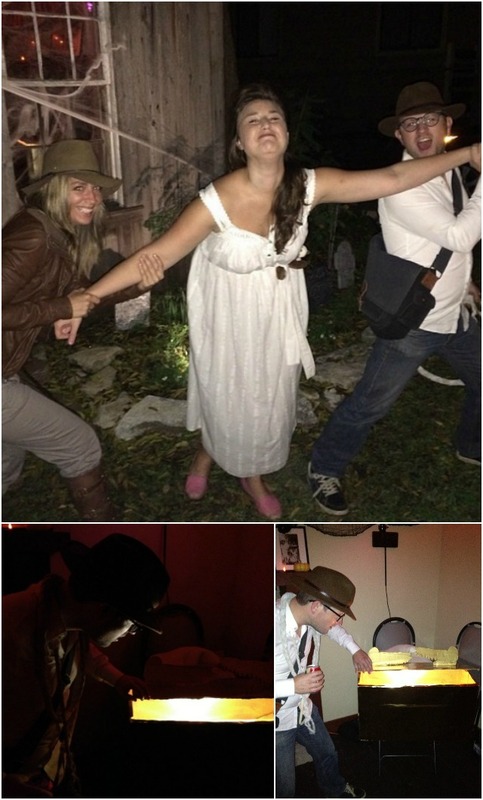 This couples costume comes with a fun accessory, an arc of the covenant! My friends crafted up a cardboard Arc of the Covenant and filled it with candy for people to raid. 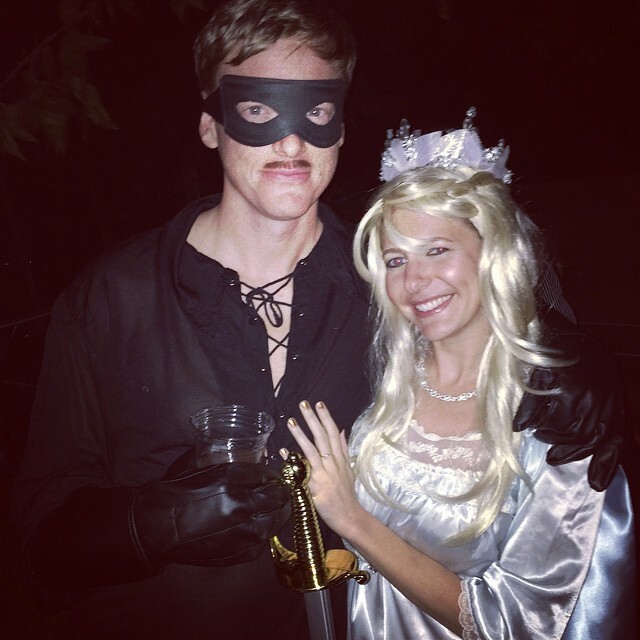 If you prefer romantic comedies, how about Princess Bride Buttercup and Westly costumes?! 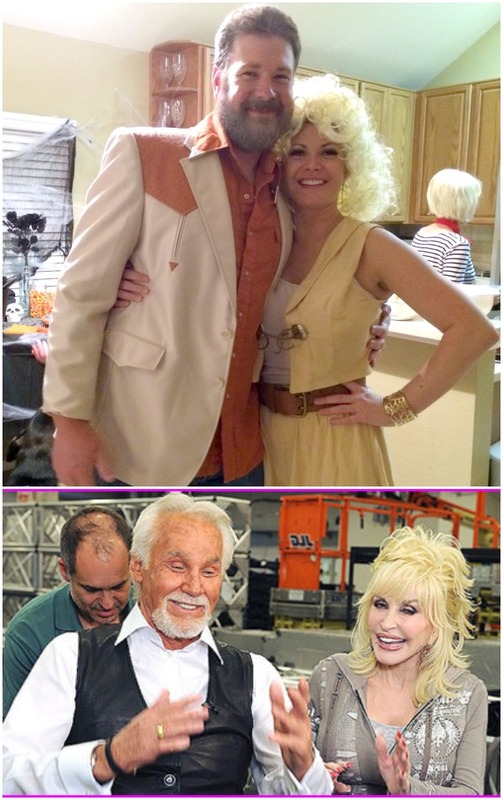 If country music is more your thing, Dolly Parton and Kenny Rogers make the cutest couples costume. This one works perfectly for a man with a beard! 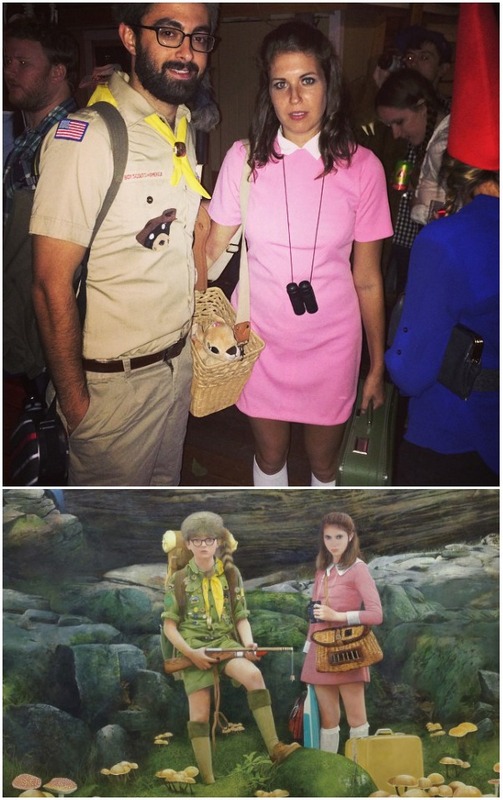 Young lovers flee to an isolated beach they call Moonrise Kingdom and wear outfits that make great Halloween costumes! Psst… Here’s a perfect dress to be Suzy! 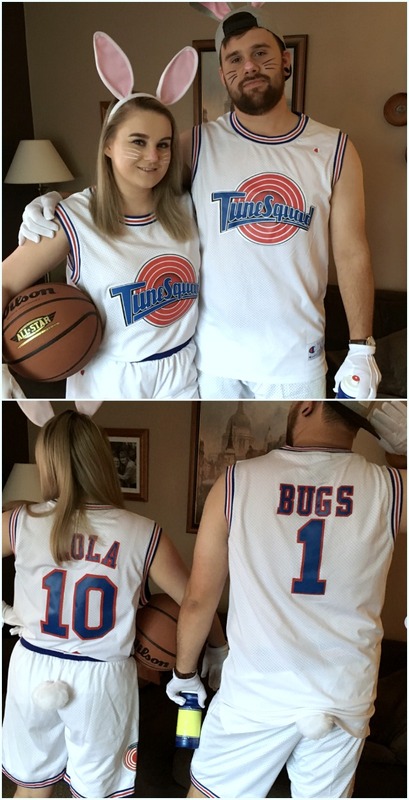 All you need for this Lola Bunny Space Jam costume is a simple jersey, bunny ears, white gloves, and, of course, a basketball! (Here is a perfect Lola Bunny jersey!) Also, can you believe Space Jam cam out in 1996, that is 22 years ago! If you are a child of 90’s, I know you know Doug and Patty Mayonnaise. Do you remember Doug’s alter ego Quailman? 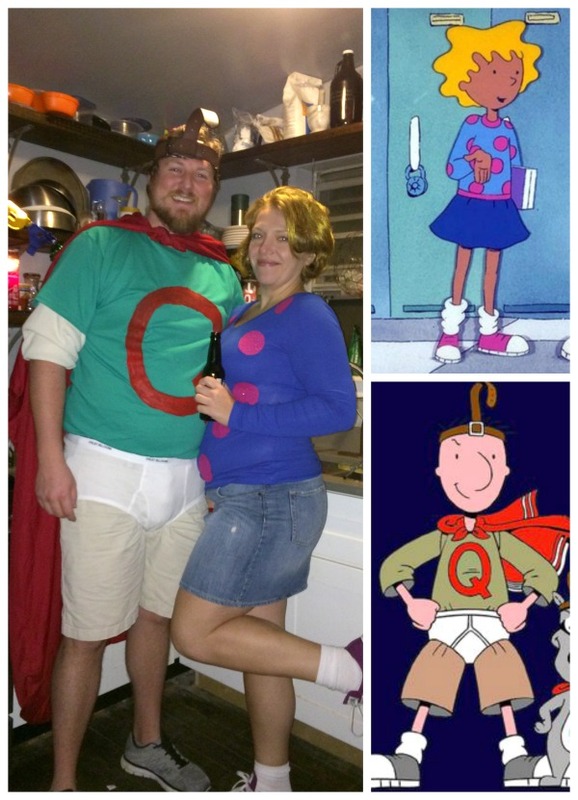 Quailman and Patty make for a cute DIY couples costume by simply wearing underwear on top of your shorts and a red cape. Patty needs a polka dotted sweater, jean skirt, and short golden hair! Who doesn’t love food? 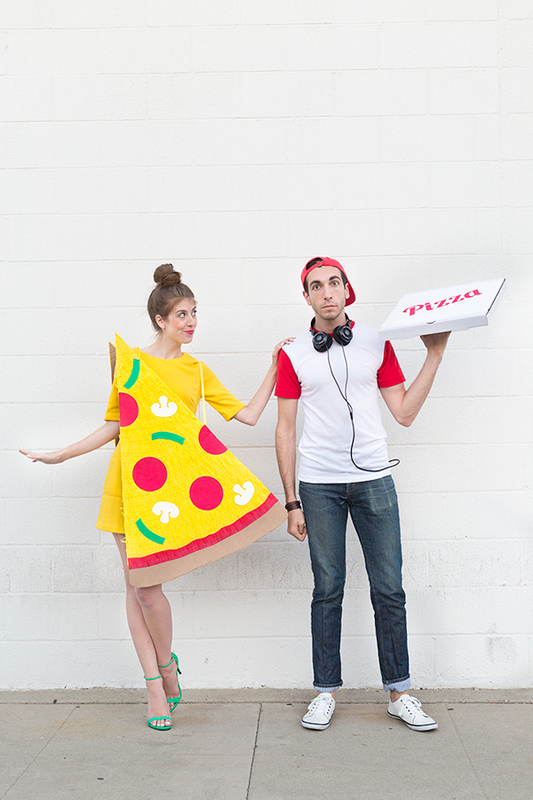 There are so many fun options for couples costumes with food. Peanut butter and jelly, bacon and eggs, cheese and wine, milk and cookies, salt and pepper, or you can go off the grid with list of silly DIY food costumes including a double stuffed Oreo! Who doesn’t love double stuffed Oreo’s? All you need for this costume is black poster board, cardboard, and string to make the Oreo a giant necklace. The milk headbands are extra fun! I made the Crown Royal bag out of a few yards of purple fabric and hand stitched Crown Royal into the fabric with gold yarn. The coke costume is super easy to make with a simple red strapless dress, duct tape, and a cutting machine. The pop top headband is a fun prop too! 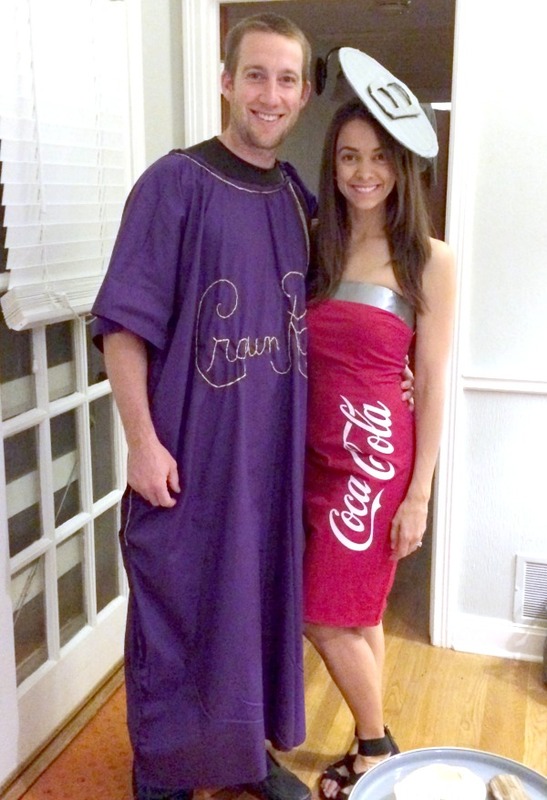 You can find a detailed crown and coke costume tutorial on C.R.A.F.T. Who doesn’t love pizza?! For a complete tutorial and tons more pictures check out Studio DIY. Funny costumes are always a winner! 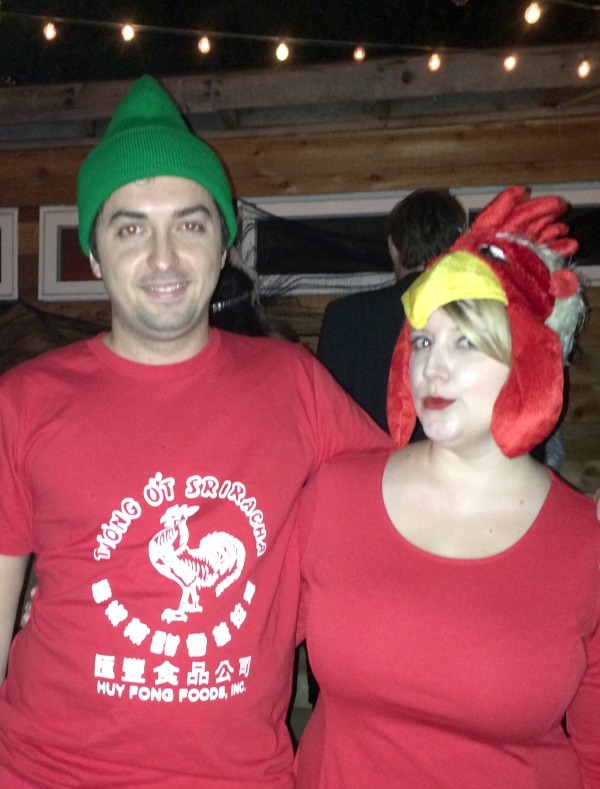 In 2016, my husband and I went as the Anthony Weiner text scandal. Andy wore underwear over his jeans, ha! 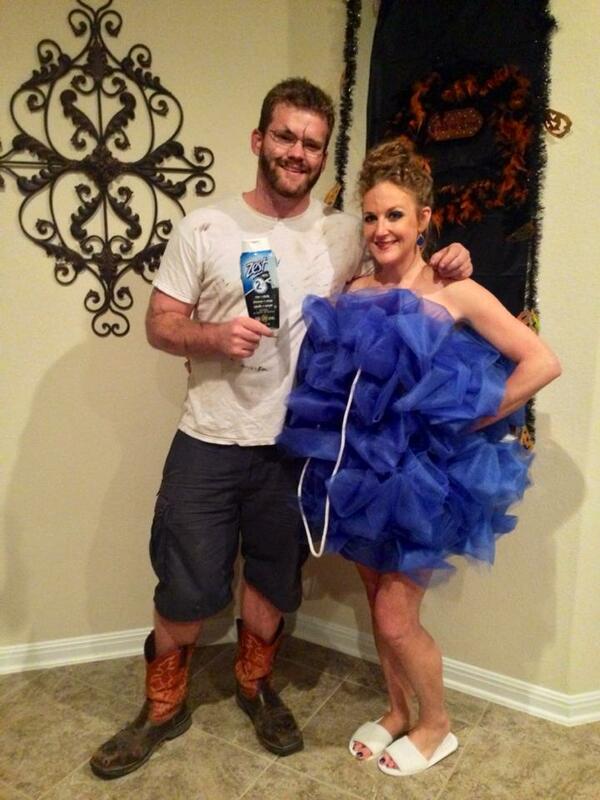 Here are 5 more funny couples costumes that are not political, you’re welcome! 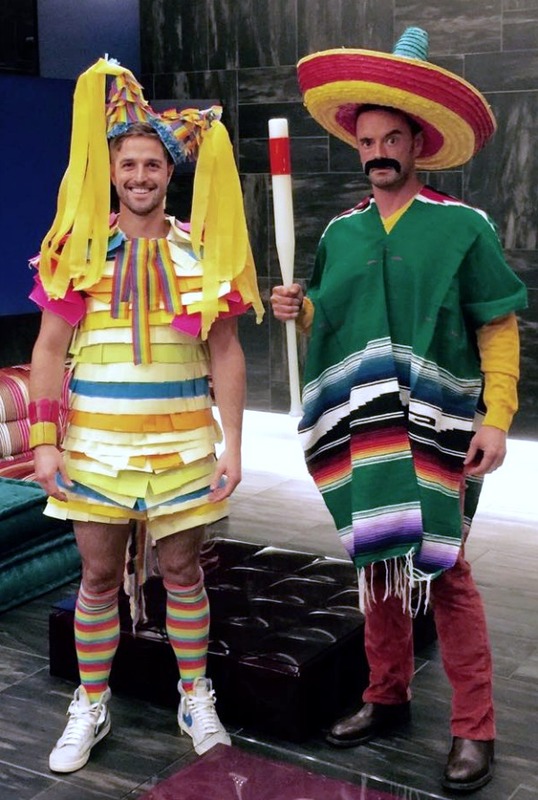 Can you believe this DIY piñata costume was made with Post It notes! It looks amazing, right? The piñata hitter can basically wear anything, but must carry around a baseball bat, ha! If you think Christmas is the most wonderful time of the year, then these Christmas Story costumes are for perfect for you! 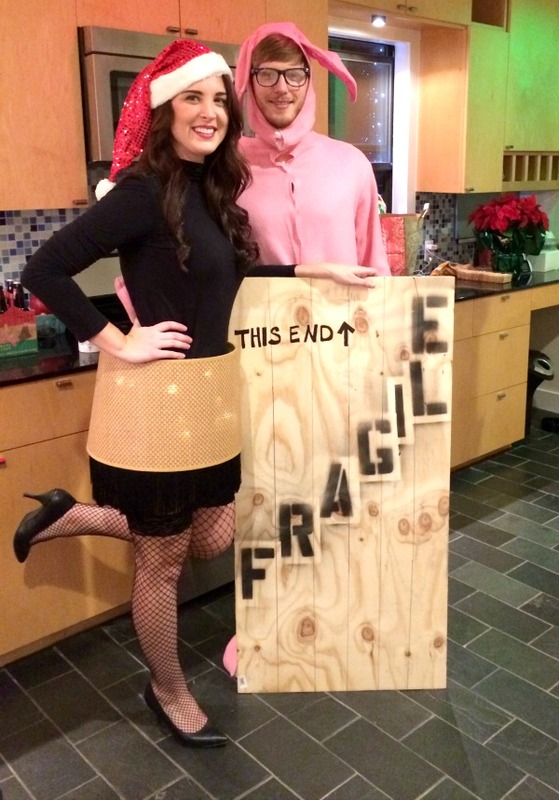 The beloved leg lamp and Ralphie in his pink bunny pajamas will get everyone at the Halloween party in the Christmas spirit whether they like it or not! 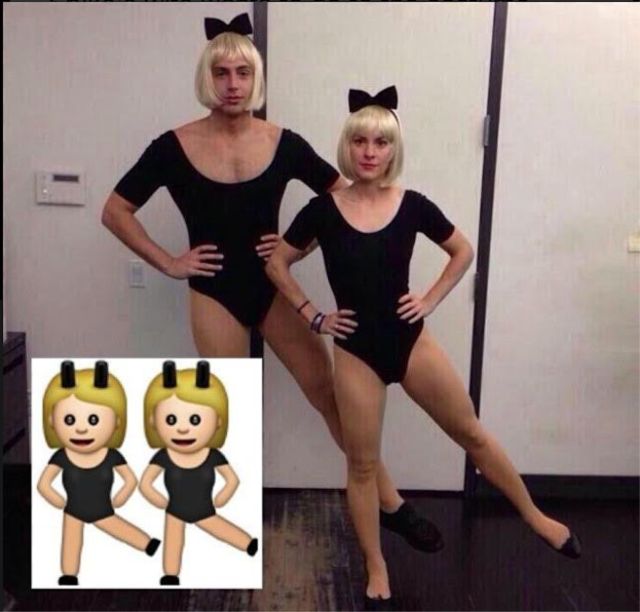 Nothing better than the dancing girl emoji unless it is a dancing boy and girl emoji! Best part? All you need are black leotards and a black bow headband! You also need to work up the bravery to wear leotards in public! 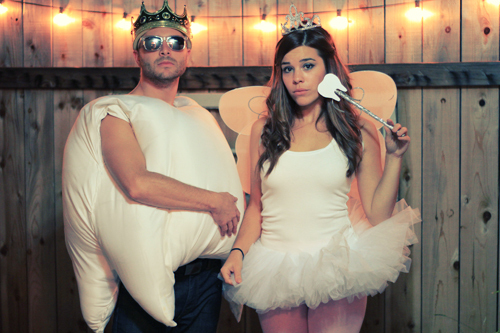 Here’s a clever couples costume idea, dress up as a tooth and a tooth fairy! For a detailed tutorial about how to make these costumes, check out Julie Ann Art. 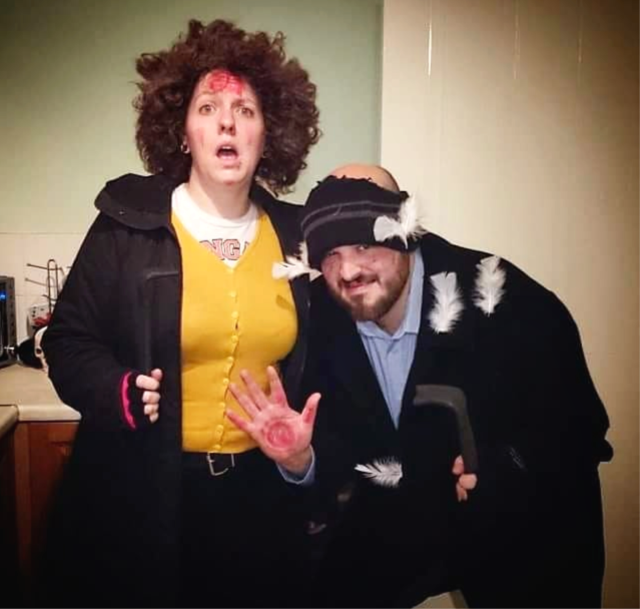 A red iron to the face and bird feathers stuck to your coat are essentials for this Harry and Marv robbers from Home Alone costume!